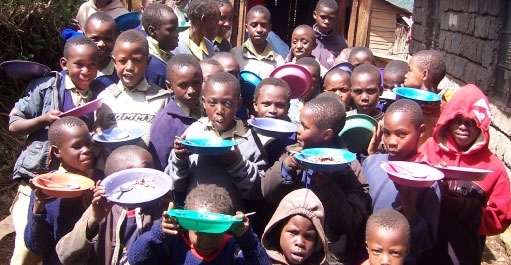 The Jambo Sana project provides a lifeline to the villagers by: - Running a feeding programme for the children - Assisting with school uniforms, clothing and school levies - Offering vocational training for adolescents, e.g. tailoring, computer skills, helping them to start a money generating trade. The Jambo Sana Centre is the base for all these activities. Over 40 children are served lunch there every school day, ensuring they have at least one nutritious meal a day and helping to improve their concentration in school. It costs around £200 to feed a child for a year. There are 10 students currently enrolled in the tailoring course, while the three computers at the centre are used by about 8 students every two hours to gain valuable skills to help them find employment. One second-hand computer in Kenya costs £100 and it costs £250 to train one student in basic computer skills. The centre is also being used by a group of adolescents who gather under the umbrella of “Kings and Queens” for Bible study, performing arts and games. These young men and women, many of whom have dropped out of school due to a lack of school fees and who have been unable to find employment, have now found a new lease of life as part of this group. Interviews & reports from our current project, Jambo Sana. "For me it was a glorious day, to see so many people gathered and all the parents and the graduates celebrating made me tearful, I knew for sure their lives will never be the same again. They can now go and get a job, start a trade and support their families. I was particularly impressed by the two students who made it into the top national schools from the feeding program. Jackson Njuguna went to Nairobi school and is the envy of the entire village. But even more so seeing a girl from the village, Josephine Mumbi who went to Moi School Kamangu. Her speech was full of thanks to Rafiki and Jambo Sana without whom she would not have made it." MCW Rafiki Trust is a registered charity in England and Wales 1109473 | Rafiki Trust ©2015. All rights reserved.